The Gowanus Lounge: Is Wonder Wheel Next Coney Shoe to Drop? Is Wonder Wheel Next Coney Shoe to Drop? “Deno’s Wonder Wheel can’t be torn down and replaced, but maybe we can incorporate the Wonder Wheel in a hotel and have it stick out the roof,” said Dennis Vourderis, co-owner of the famous Coney Island ride. 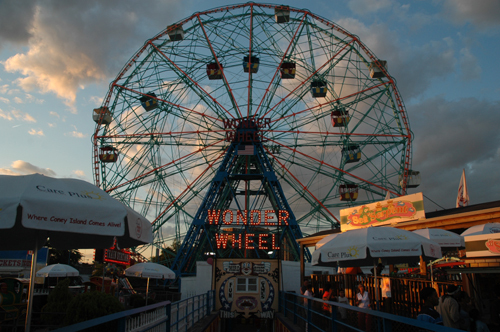 Deno’s Wonder Wheel Amusement Park encompasses an area from the Bowery to the boardwalk and from West 12th Street to Jones Walk, the border of Astroland. However, Silberstein stopped short of saying the two are negotiating a deal on the property. “We don’t comment on anything proactively or speculatively. If we have something to announce we’ll announce it,” said Silberstein. Vourderis said there haven’t even been discussions with Sitt concerning selling the amusement park. “I have no plans to sell at this time,” he said. Vourderis said he and his brother Steve, who run the park, have large families and their children have expressed interest in continuing to run the park. It would be the third generation of the Vourderis family running the park, he said. Vourderis noted, though, that Sitt is a very intelligent business person, and that given the opportunity, would probably love to own the Wonder Wheel as a centerpiece of Coney Island. We'd be willing to bet significant money that Wonder Wheel Park is toast too.